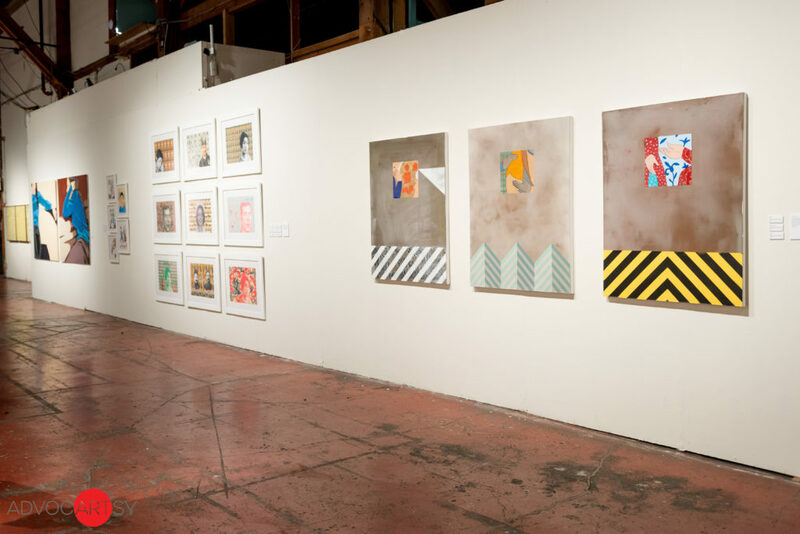 Read About “An Art + Design Collaboration” in LA Weekly! 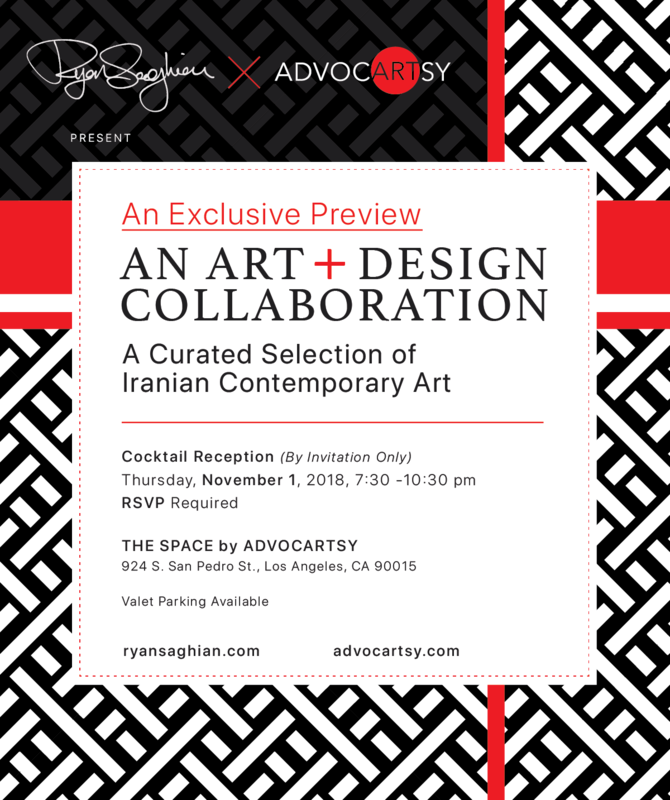 THE SPACE by ADVOCARTSY, created to raise awareness of and engagement within Iranian contemporary art, is pleased to collaborate with LA-based, Iranian Interior Designer, Ryan Saghian. 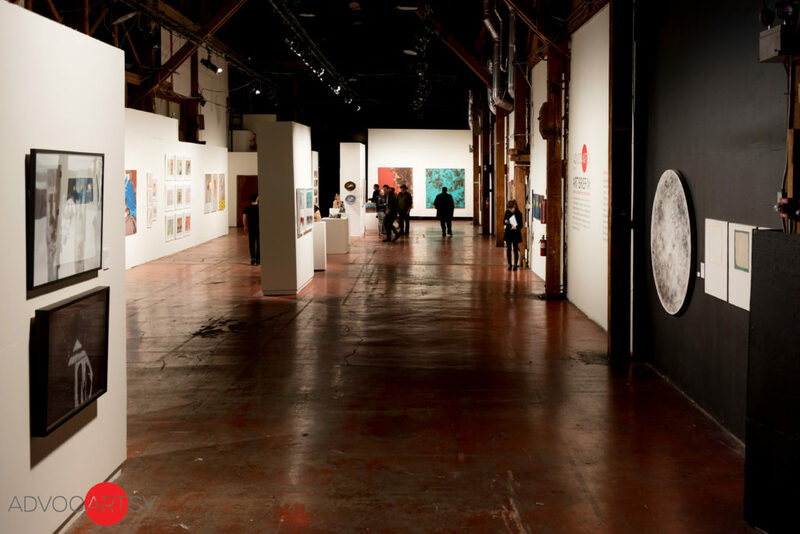 This is THE SPACE’s first design and art collaboration. ADVOCARTSY’S mission is to elevate awareness and engagement with Iranian contemporary art. With this collaboration, ADVOCARTSY broadens its mission by engaging the community with a noted Iranian designer expanding public exposure. 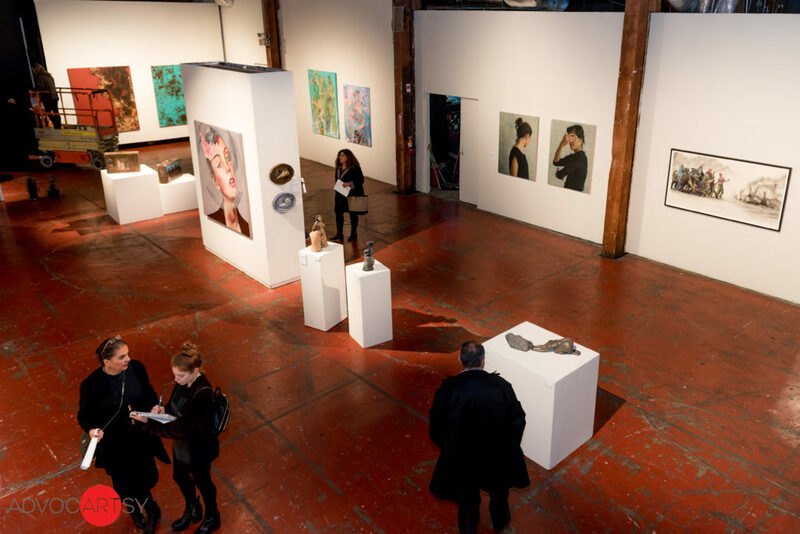 The art chosen for this debut collaboration carries a wide range of expression that will resonate and intrigue its audience within the contemporary art realm at large. “I am honored to be the first designer chosen to collaborate with ADVOCARTSY. Art is everything when it comes to interior design. It reflects the style of homeowner and it should be a representation of who you are,” says interior designer, Ryan Saghian. 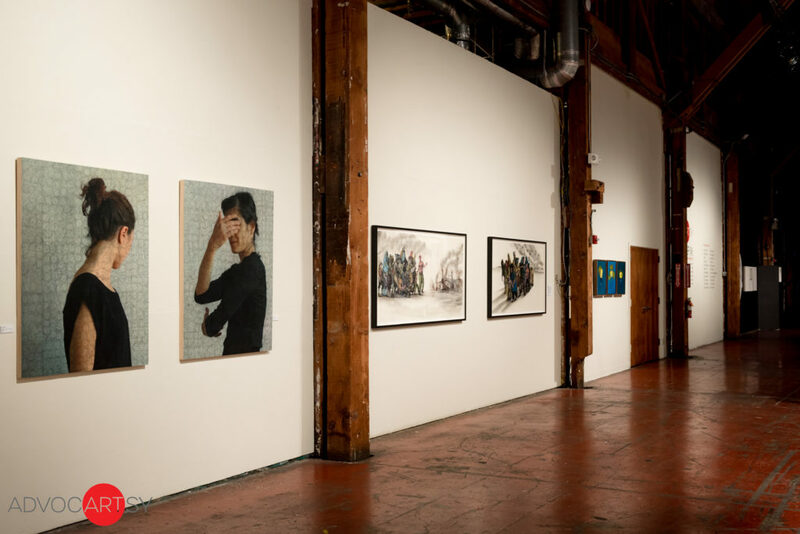 “As an Iranian American, Iranian Contemporary art speaks to me on a personal level, and also reveals the essence of the human condition which plays a major role in everyone’s life.” “In this collaboration, we have selected a wide range works by Iranian contemporary artists. The work appeals to the sophisticated design world with a universal connection,” says Roshi Rahnama. “All the work chosen are of museum quality and reflect the style and sophistication that Ryan Saghian brings to all his projects.” Great art has become an essential component of a modern home. The collaboration speaks to the importance of art in the home as it speaks to the self-expression of the collector. The art showcased and selected for this collaboration is from a roster ADVOCARTSY collaborating artists which reflect a wide range of expression and speak to the unique experiences of the Iranian Artists. 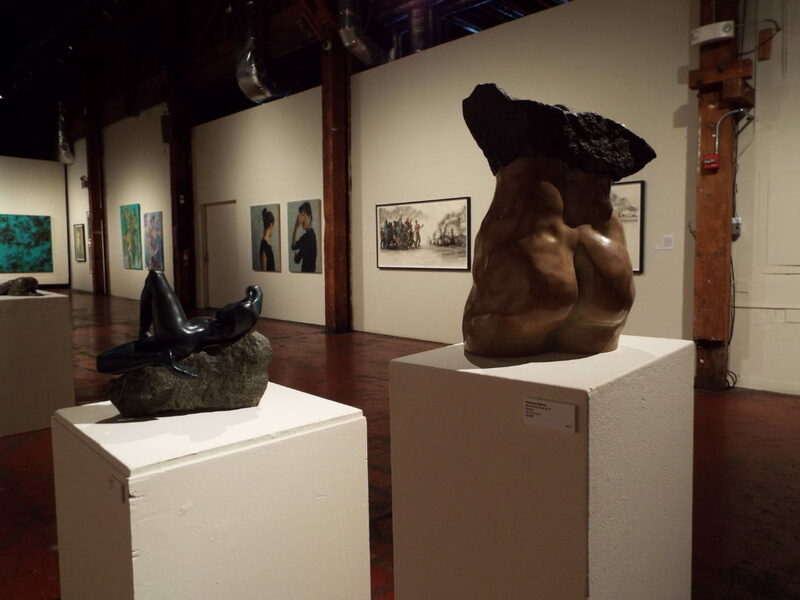 The selection includes multimedia, sculpture, painting, and digital photography. 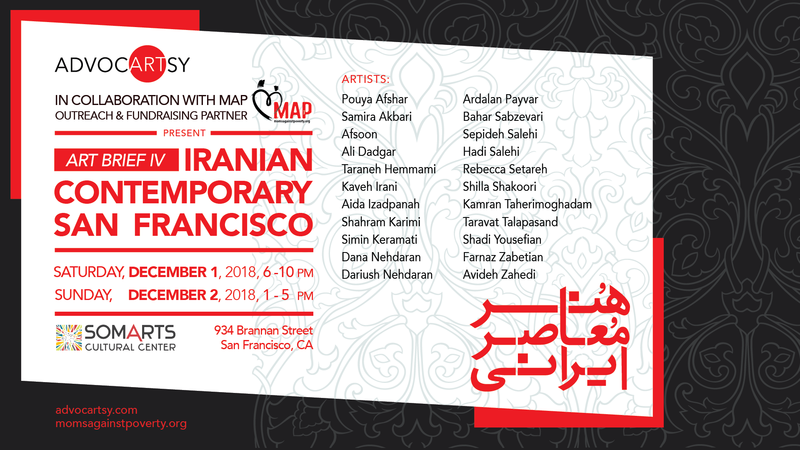 The artists selected for this unique showing include: Hessam Abrishami, Pouya Afshar, Afsoon, Shahram Karimi, Dana Nehdaran, Mobina Nouri, Aida Izadpanah, Rebecca Setareh, Sepideh Salehi, Shilla Shakoori, and Melika Shafahi, Farnaz Zabetian. 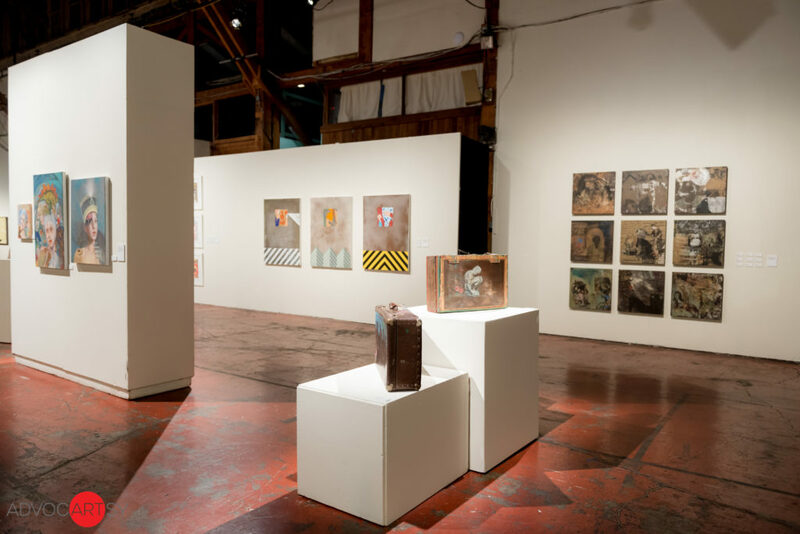 Hours: Tuesday–Saturday, 12.– 5 p.m.
ABOUT RYAN SAGHIAN Born in Los Angeles, Ryan received his Bachelor of Science degree in Interior Design from the Art Institute of California’s CIDA design school. With over 10 years of experience in the field, Ryan has endured a body of design skills taking human elements into consideration when designing a space. To add to his extensive portfolio of work, Ryan recently launched Ryan Saghian Collection, a custom couture furniture collection available through J Alexander and his new flagship showroom in Los Angeles. All pieces are handmade in Los Angeles and can be fully customized. In addition to his new furniture line and showroom, Ryan also recently introduced his own Wallcoverings collection, handmade with rich, natural materials including fine silk, cork, and grasscloths. 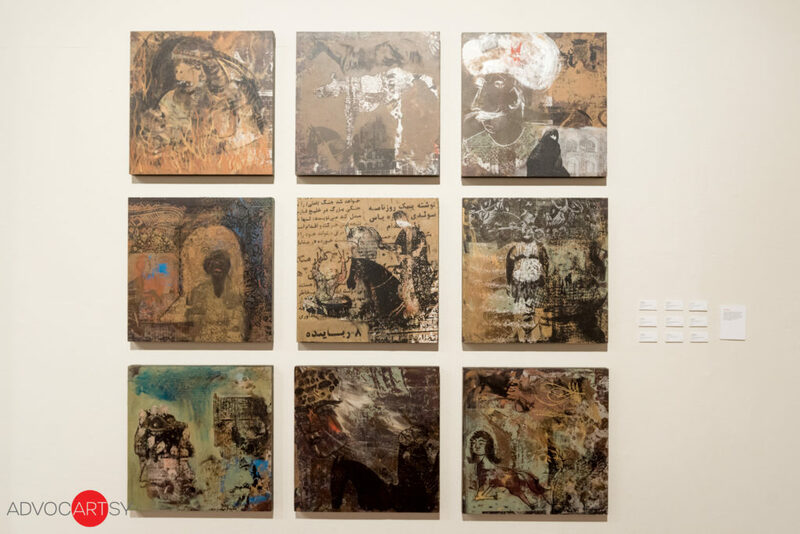 THE SPACE is a permanent extension of ADVOCARTSY’s Art Brief exhibition series launched in 2015, a contemporary fine arts platform that aims to raise awareness and engagement with Iranian contemporary art. 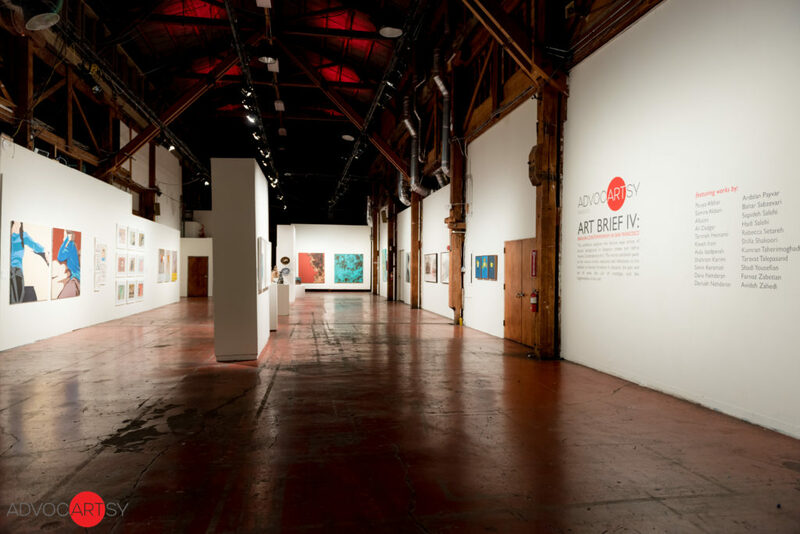 ADVOCARTSY hosts diverse fine art events, educational programs, exhibitions, and other events, with a wide range of collaborations, both nationally and internationally as a nexus for artists, critics, curators, and collectors. 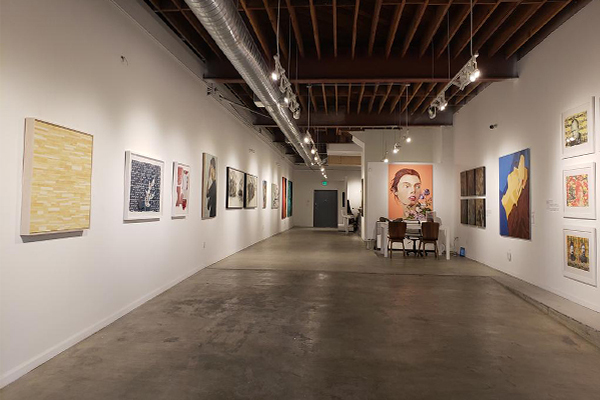 The 1,800 square-foot-space is ideally situated in the heart of Downtown LA’s Fashion District, minutes from the rapidly expanding arts district and LA’s newest museum, the Institute of Contemporary Art, Los Angeles. Hessam Abrishami was born in Shiraz, Iran in 1951. He has been greatly influenced by the ancient history that surrounded him as a child. Seeking a society free from the limitations of modern day Iran, Hessam left his home country to expand his knowledge and awareness of the outside, changing world. 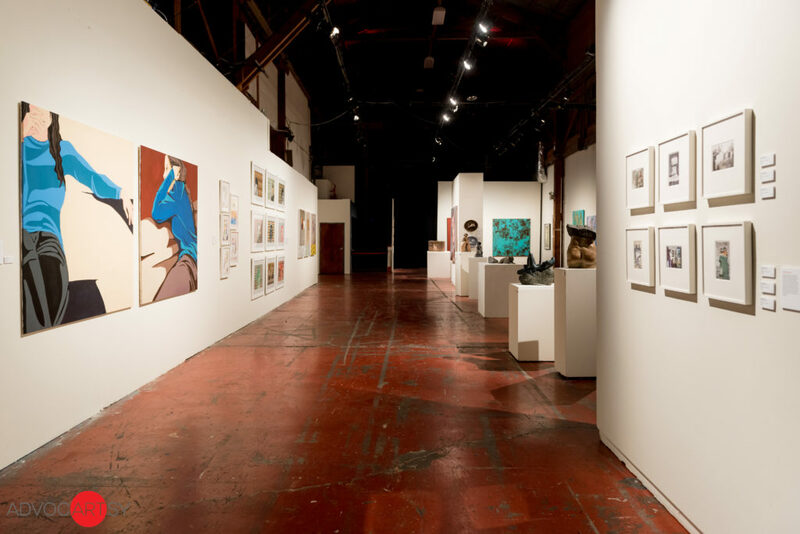 Currently, Hessam has countless private collectors world-wide and has exhibited in over 130 One-Man Gallery Shows, over 30 International Exhibitions, and multiple Museums Exhibitions. Hessam was recently presented with the “Key to the City” of Ormond Beach, Florida where his work is currently displayed in the Museum of Arts and Sciences. Pouya Afshar works in a diverse range of media to create artworks that challenge the socio-political concerns of both eastern and western cultures. 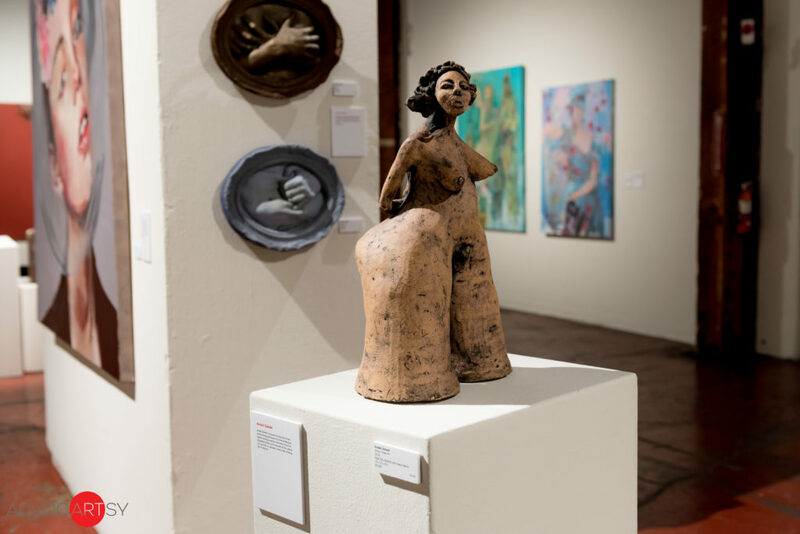 He has exhibited his work as an animator and visual artist at renowned locations such as Harold M. Williams Auditorium at the Getty Center, Los Angeles County Museum of Art, Santa Monica Art studios, among others. 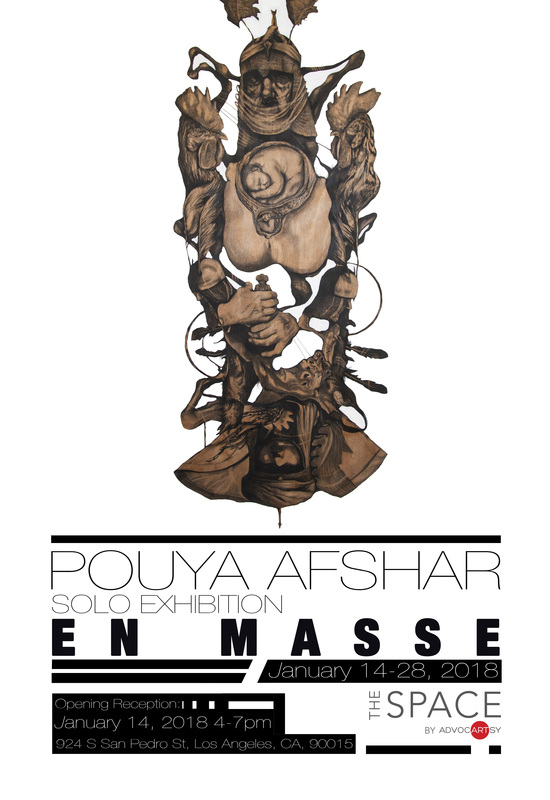 Currently, Pouya is an assistant professor of Art and Design at University of Massachusetts, Lowell. 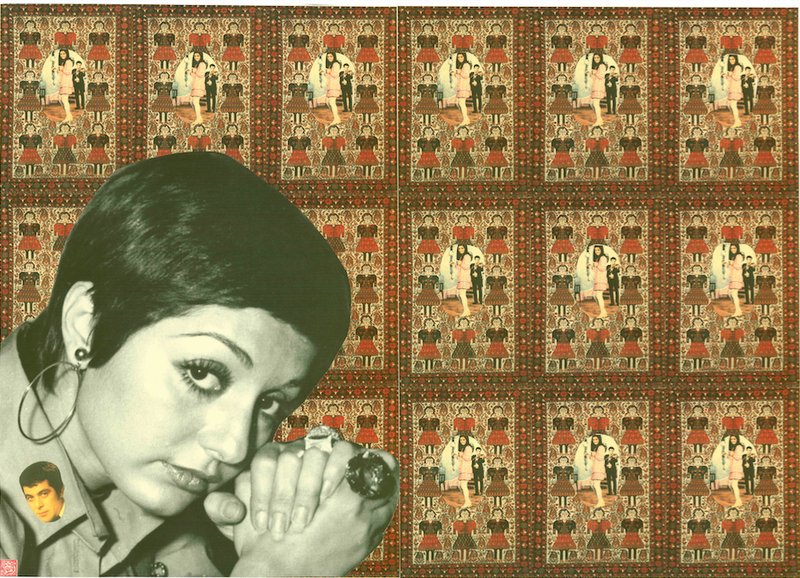 Afsoon works with her own collection of vintage images to create illustrious collages. 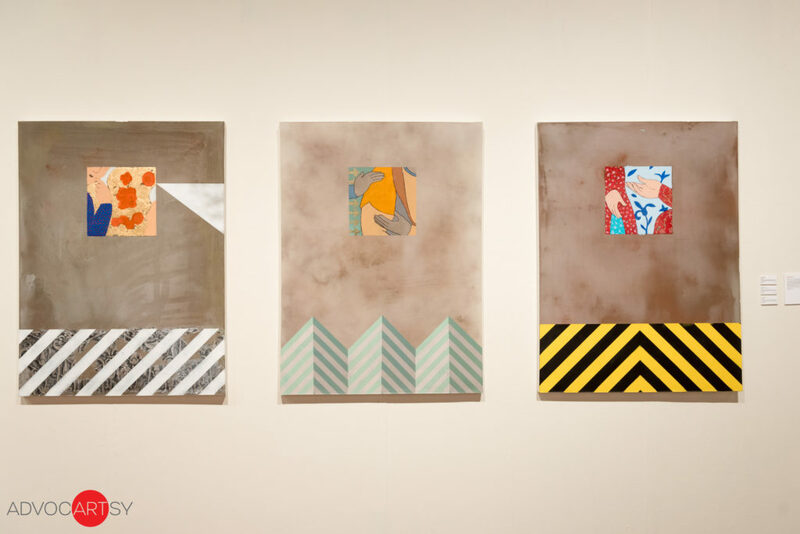 Through a combination of techniques, Afsoon’s rich, and often playful, works reflect the merging of East and West, allowing the audience to find the familiar and foreign. 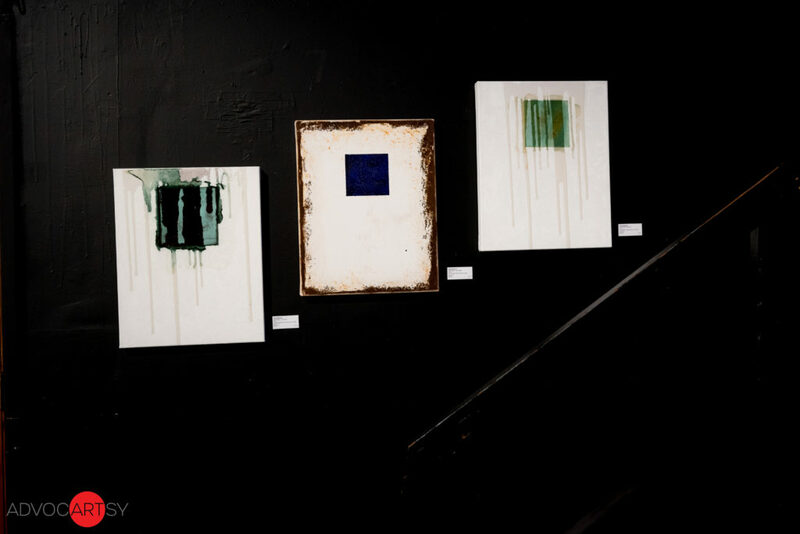 Afsoon’s works have been extensively exhibited and can be found worldwide in prominent collections and museums, including the British Museum, Los Angeles County Museum and Berger/YSL Collection, among others. 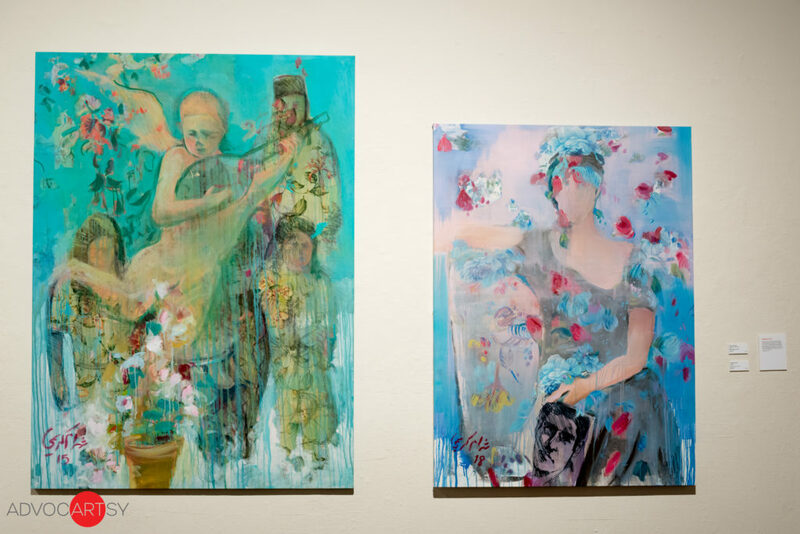 Aida Izadpanah possesses a diverse repertoire of media and styles, having worked for many years in acrylic, oil, mixed media, watercolor, photography, floral design, and porcelain painting. She specializes in European styles, ethnic Persian motifs, and modern designs, as well as dynamically textured abstract works. She is currently based in New York City. Dana Nehdaran studied painting in Iran and recently migrated to New York. 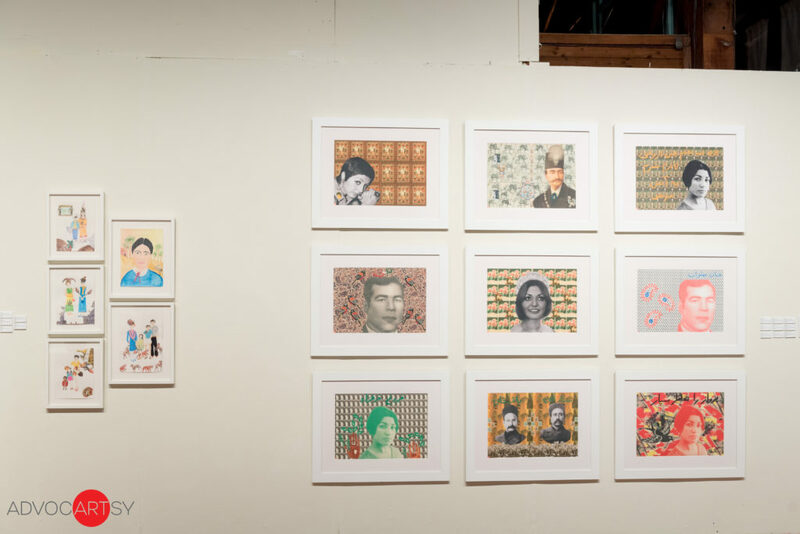 Nehdaran’s portraits captivatingly capture the nostalgia and historical past, seamlessly connecting the past to contemporary culture. Hadi Salehi is a master of analog photography who resides in Los Angeles. Salehi’s images capture diverse portraits that are nostalgic, powerful and soft, leaving a haunting quality that lingers in the psyche. 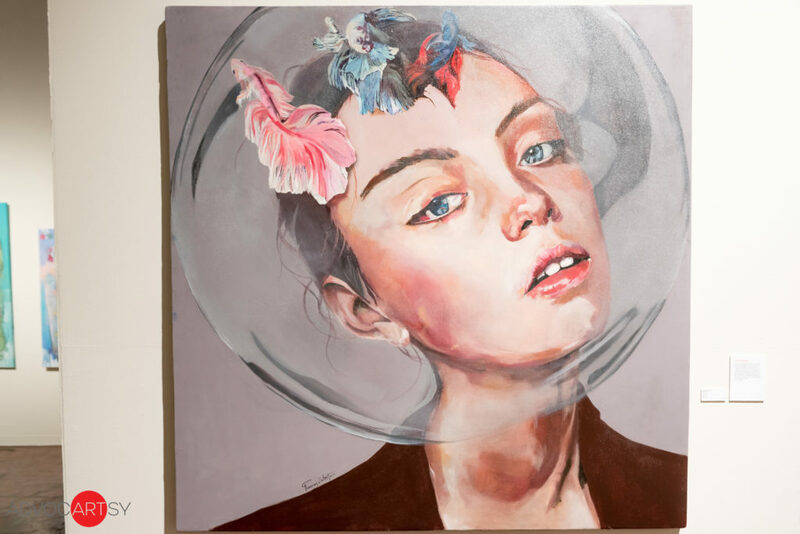 Sepideh Salehi is based in New York City and works in collages, paintings, printing, photography, and video animation. 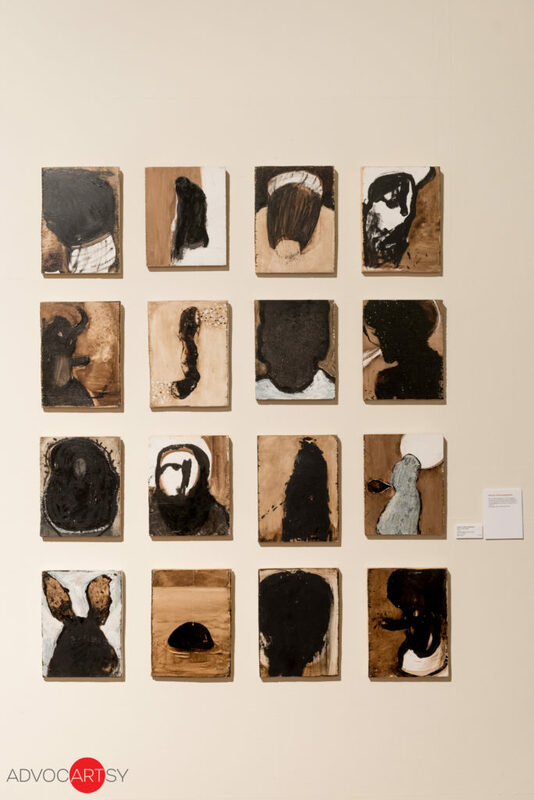 Her works revolve around the poetics of the veil as well as stories from her country of origin. 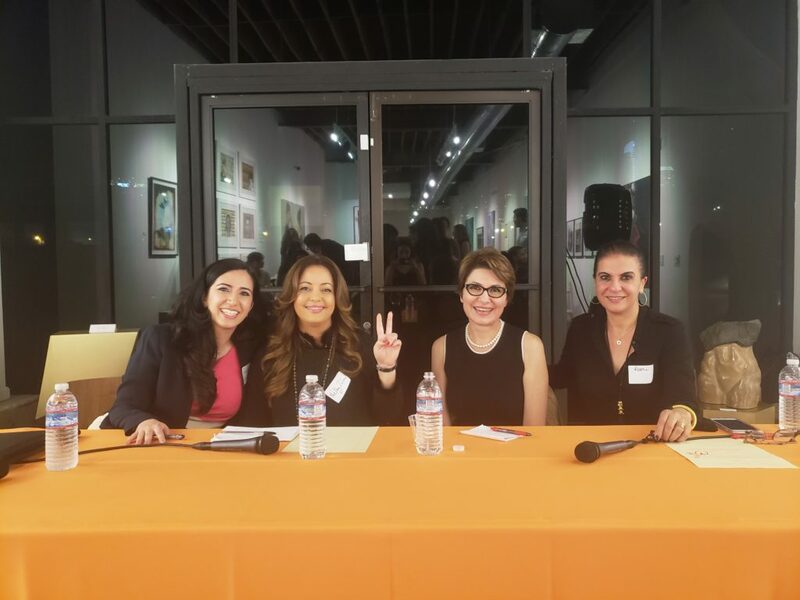 Rebecca Setareh has garnered international attention for her talents. 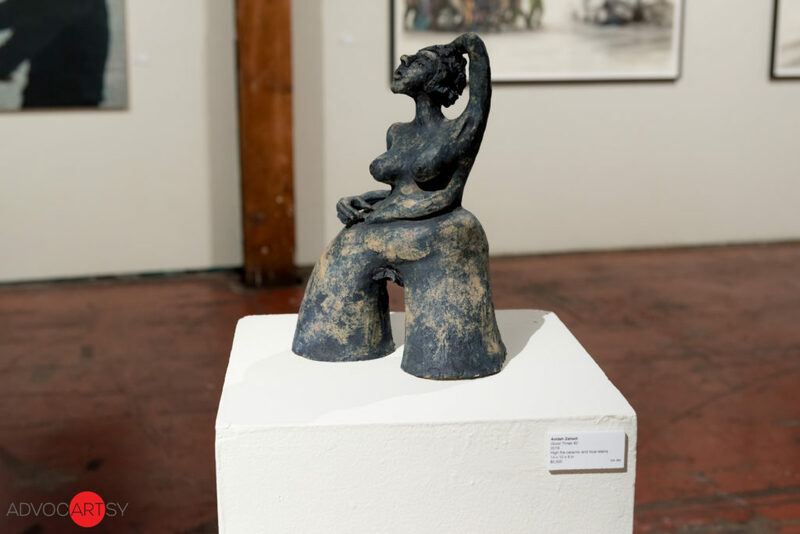 She has been featured in numerous exhibitions nationally, and has most recently received praise for her unique, graceful integration of rock and bronze. 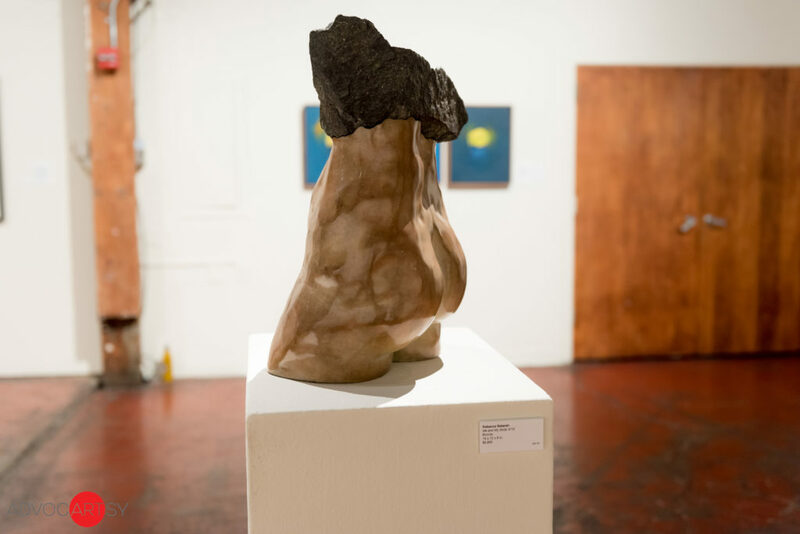 Beautifully so, Rebecca creates an aesthetically-whole form from inherently contrasting materials in a creative process that represents the struggle of life itself. Melika Shafahi was born in 1984 in Tehran, Iran. She lives and works in Tehran & Paris. In her photographic work she aims to show the hidden part of life in Iran, the private life of her generation who were born after the 1979 revolution, a generation far from religious fundamentalism. 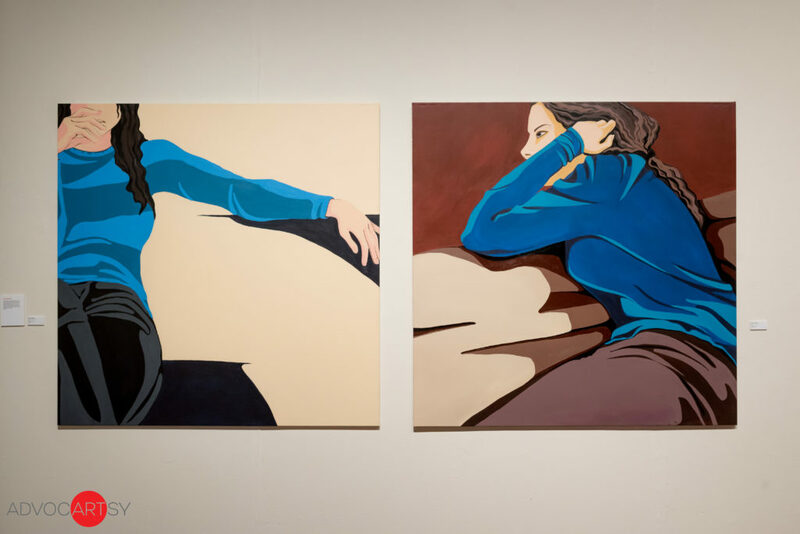 Her artistic focus is on the contradictions between public and private life of the Iranians, as well as how westernization has affected her generation. Shilla Shakoori is a painter whose diverse artistic output springs from an exploration of the synthesis between native and adopted cultures. 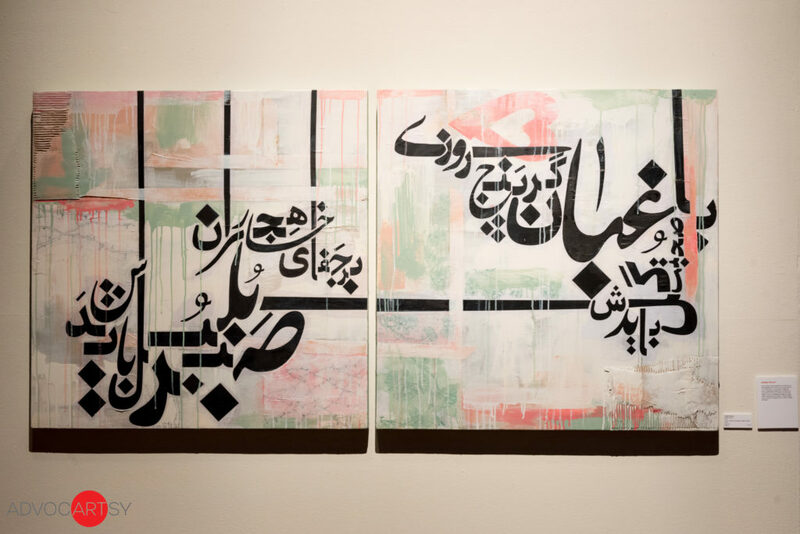 Shakoori’s works are strongly influenced by Iranian philosophy and myth, with strong influences by Rumi. Shadi Yousefian is currently based in San Francisco. Yousefian’s mixed media work reflects and addresses issues that touch on universal themes such as loss, dislocation, alienation, and reinvention. 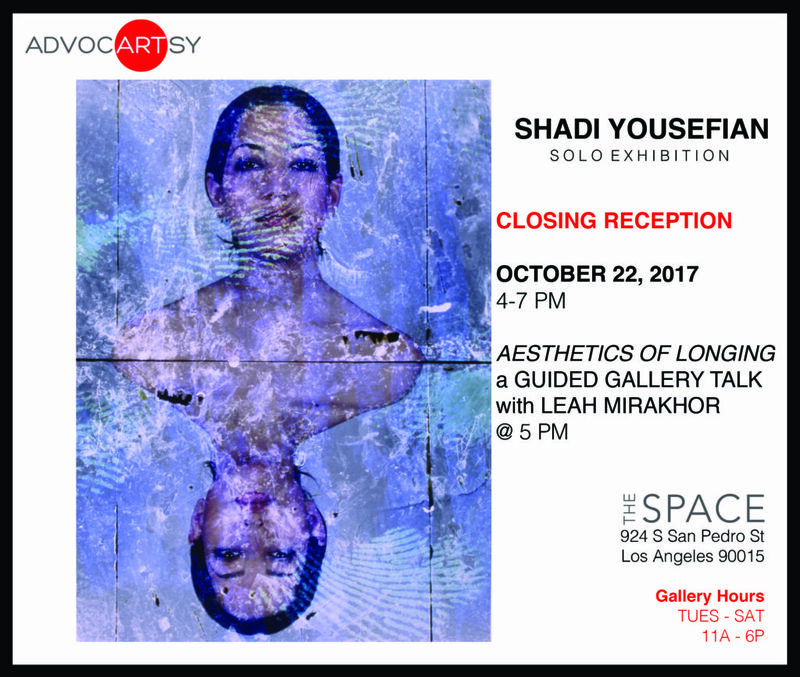 Shadi has work in the permanent collection of the Los Angeles County Museum of Art, among others. 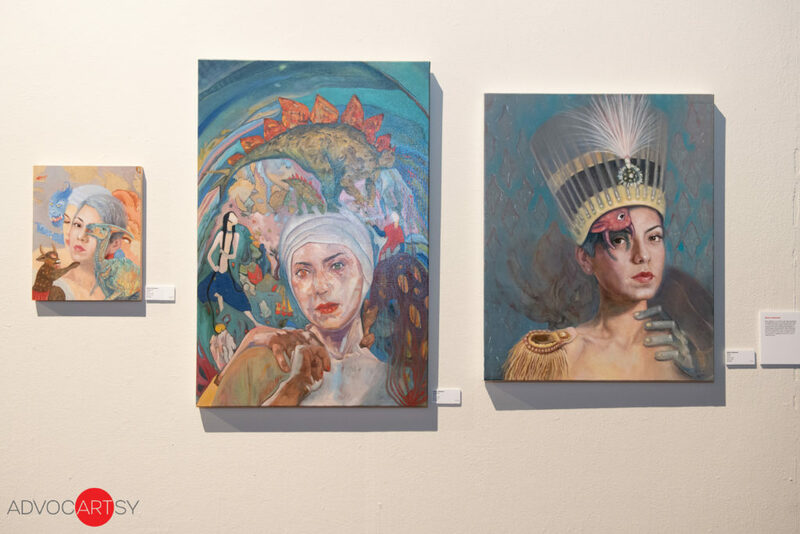 Farnaz Zabetian paints manifestations of daily life, exploring the struggles of Eastern women as they are forced to navigate social taboos and ideals since birth. 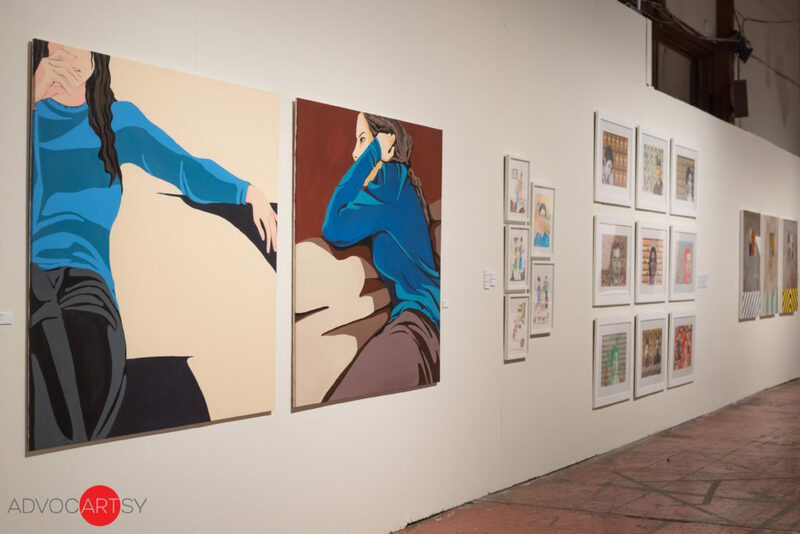 Her symbolic and expressive portraits of these women depict their private thoughts and yearnings, as well as their perceived relationship with the rapidly modernizing world. Zabetian is based in the San Francisco bay area. 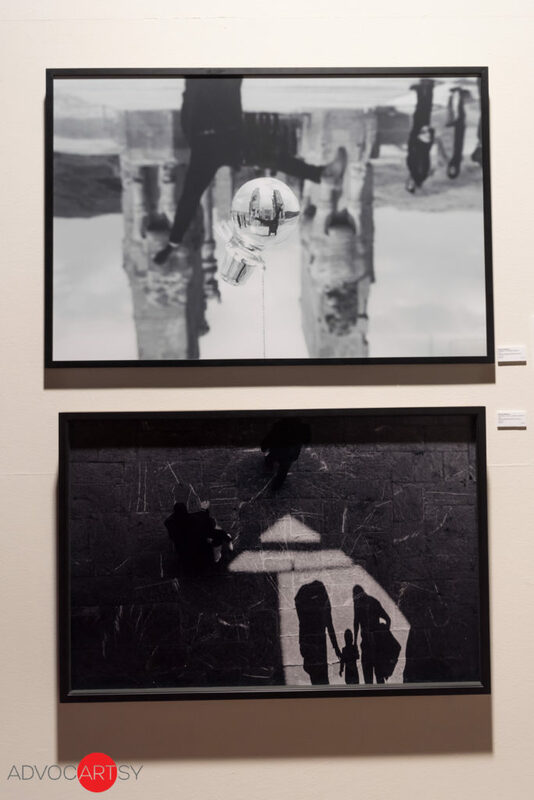 Shahram Karimi, who recently curated In Between I and II at MANA Contemporary writes, Over the past decade we have witnessed serious attention towards Iranian art and artists. Through numerous international exhibitions Iranian art has established a strong and clear position in the art world. Therefore, we must begin to ask ourselves what distinctive characteristics modern Iranian art presents in relation to Iran’s abundant cultural heritage and what are the contributions of artist who live outside of Iran? The answer to this question will lead us towards a deeper understanding of the new Iranian cultural identity. We must strive to avoid familiar clichés and locate a more profound understanding of these new aspects and visions of Iranian art. National artistic identity, arguably even socio-cultural identity, is a product of the sum of individual artistic creativity. 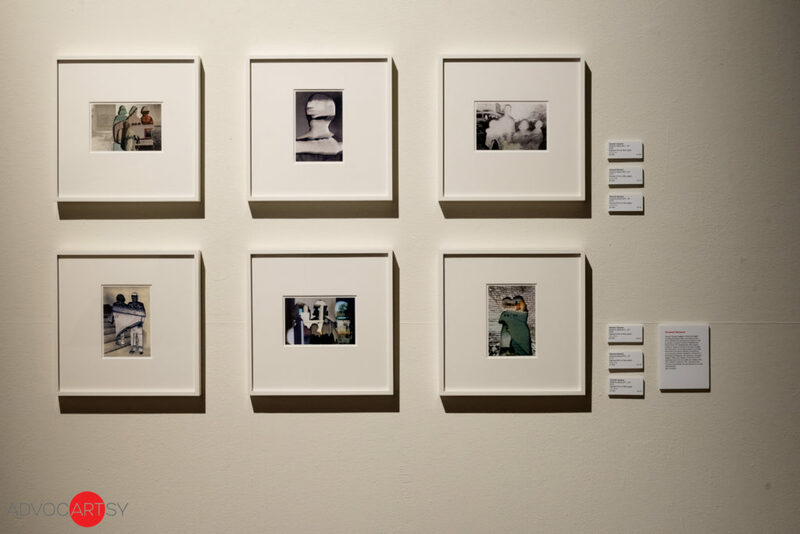 Artists combine their history with contemporary influences of their particular present day social contexts. The common indicators of traditional culture no longer represent the identity of modern artists. 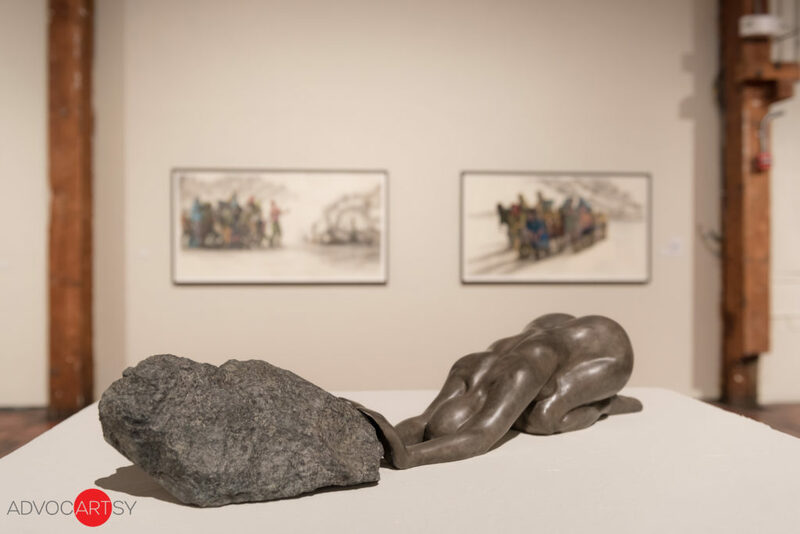 While this group of work is varied in form and content, it is the ideas of authenticity and unique gesture that unite them. Each artwork has an exceptional sense of spontaneity, freedom and resolve that suggests the character of the maker. (b. 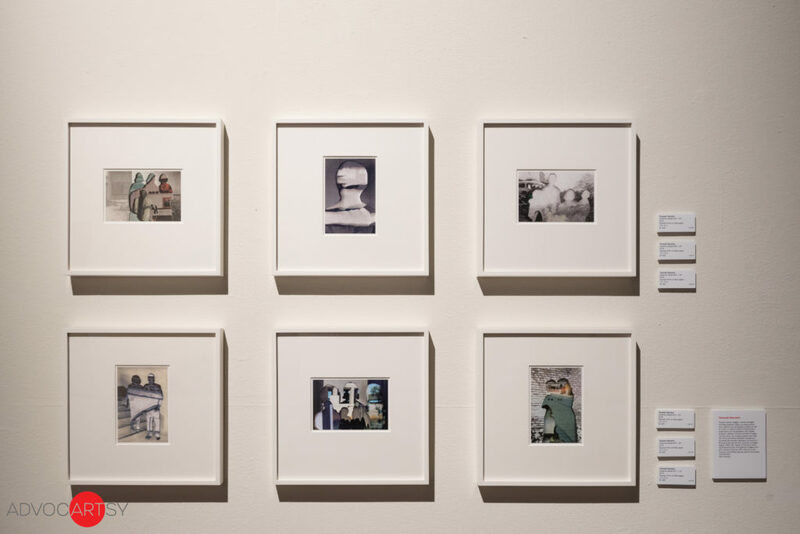 1961 in Iran, lives and works in London, UK) combines collage, photography, painting and text that deals with her nomadic lifestyle where the East merges with the West to create something that is at once familiar while simultaneously foreign. 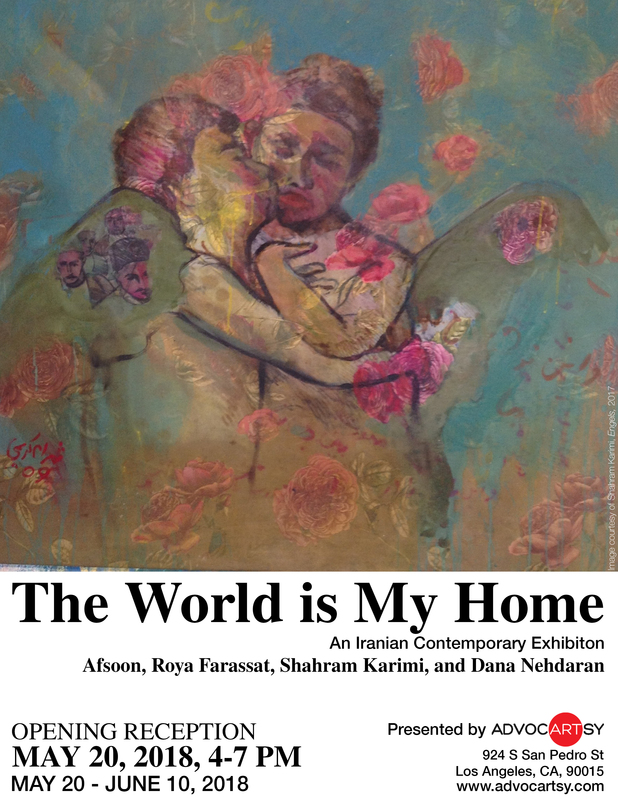 Afsoon has been exhibited in the United States, Europe and the Middle East. Afsoon is also part of several permanent collections include Los Angeles County Museum, The British Museum and the Berger/YSL Collection. 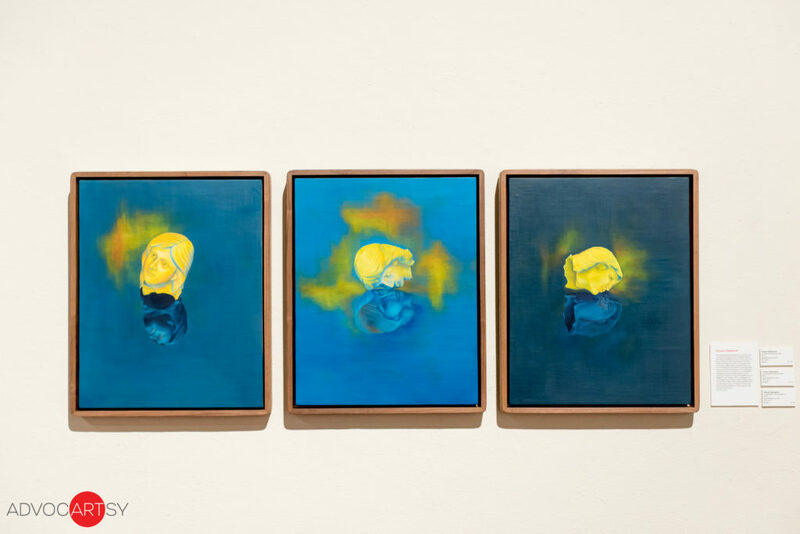 She is included in LACMA’s upcoming exhibition, In The Fields of Empty Days: The Intersection of Past and Present in Iranian Art, opening May 6, 2018. (b. 1964 in Tehran, Iran, lives and works in New York, NY) work is largely influenced by culture and tradition while embracing a distorted sense of reality. 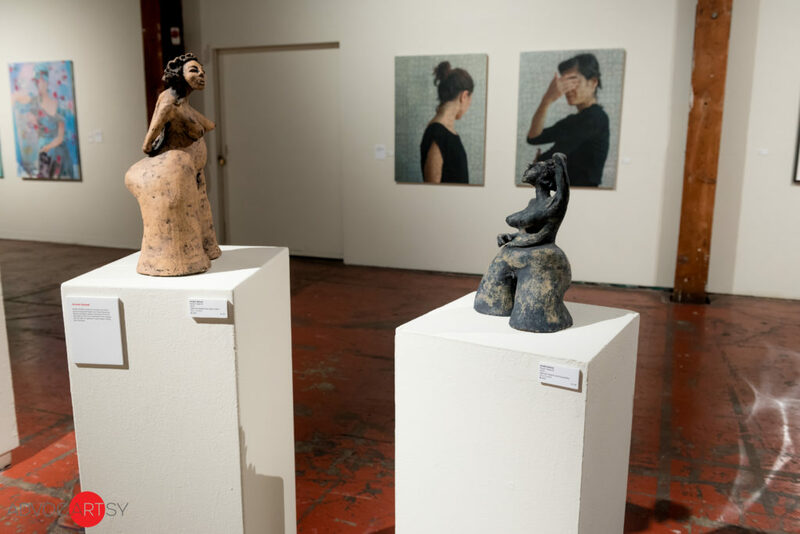 The themes of female Identity, isolation, violence and oppression animate her sculptures and paintings. 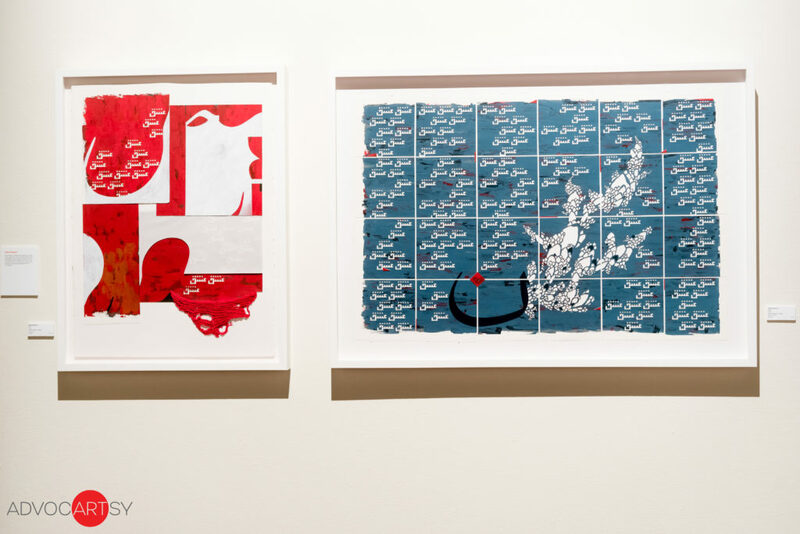 Farassat has had solo exhibitions at Shirin Gallery, New York, NY, 2015 and Leila Heller Gallery, New York, NY, 2011. 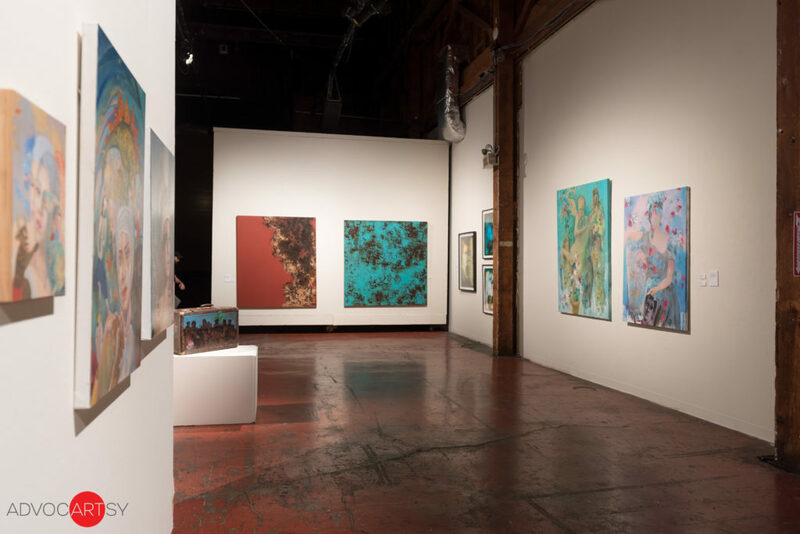 She has been apart of several group exhibitions including, Albin Polasek Museum, Winter Park, Florida, 2018; Station Independent Projects, New York, NY, 2017 and Gallery Kayafas, Boston, Massachusetts, 2017. She has also been interviewed and published by the New York Times, Boston Globe and Hyperallergic among others. (b. 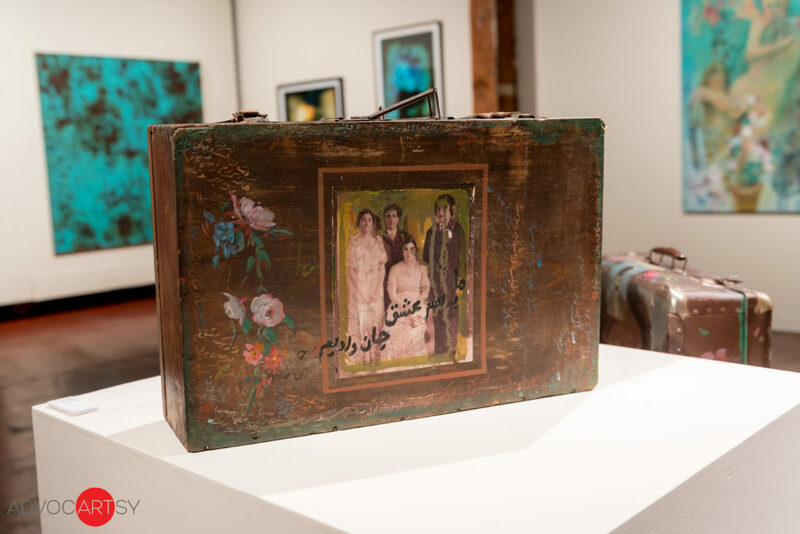 1957 in Shiraz, Iran, lives and works between Germany and New York, NY) paintings portray the dilemma in the contemporary bicultural Iranian who seeks their historical and personal identity through wedding their personal past with contemporary form. He has exhibited worldwide including Iran, Turkey, Germany, Switzerland and the United States. 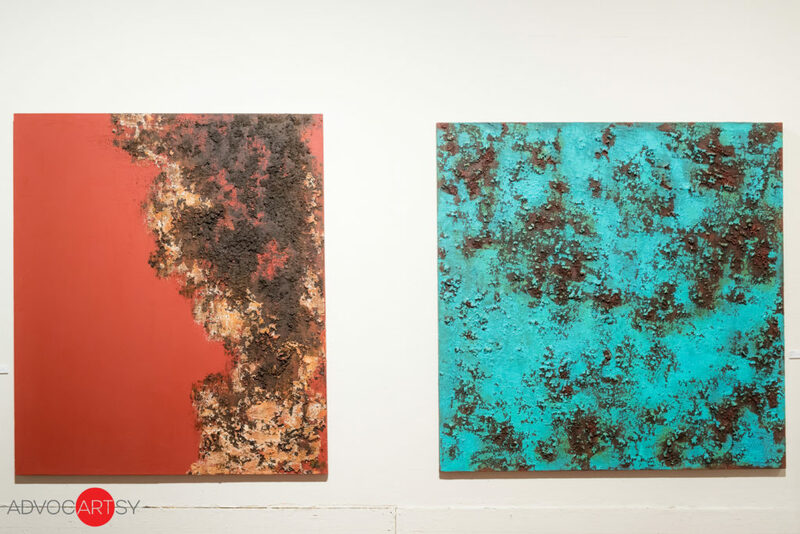 He has had recent solo exhibitions at Leila Heller Gallery, New York, NY, 2016; Syra Gallery, Washington D.C., 2015 and Brigitte Schenk Gallery, Cologne, Germany, 2015. (b. 1982, Chaharbagh, Iran, lives and works in New York, NY) received his BA in painting from Soureh Art University in Shiraz in 2007. 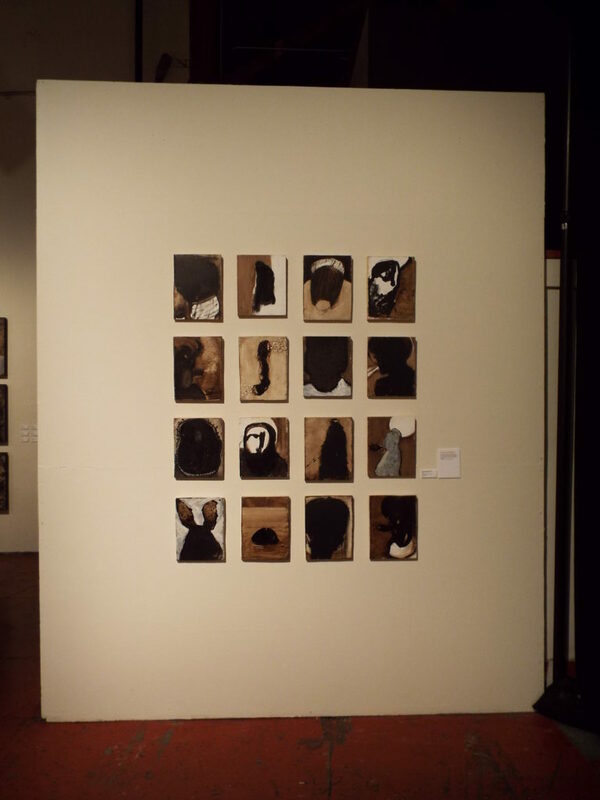 Recent solo exhibitions include Rira Gallery, Dubai, UAE, 2013 and Shirin Art Gallery, Tehran, Iran, 2011. 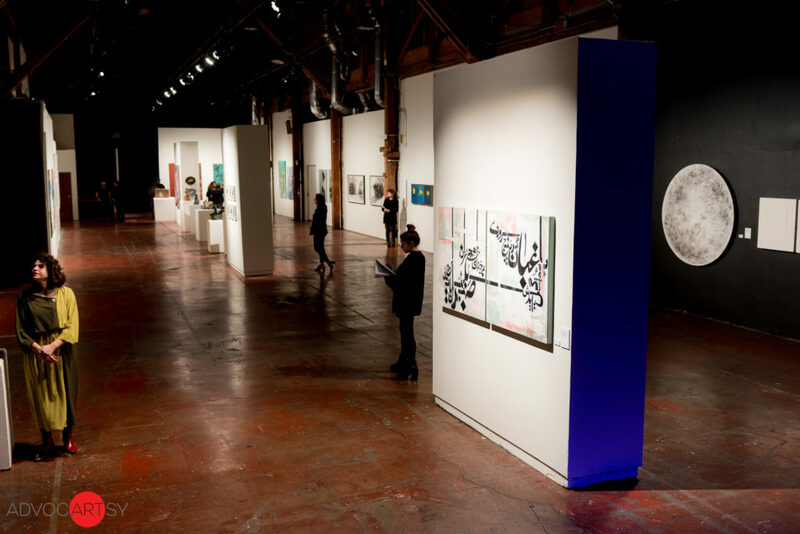 Nehdaran was apart of ADVOCARTSY’s Art Brief II: Iranian Contemporary North America, Los Angeles, 2016. Dana has been a member of the Iranian Painter Association since 2007. Nehdaran utilizes classical painting techniques to focus on the tension between past and present. with Iranian Contemporary Arts both nationally and internationally. THE SPACE by ADVOCARTSY is pleased to present Reveal, a solo exhibition of works by Sepideh Salehi. 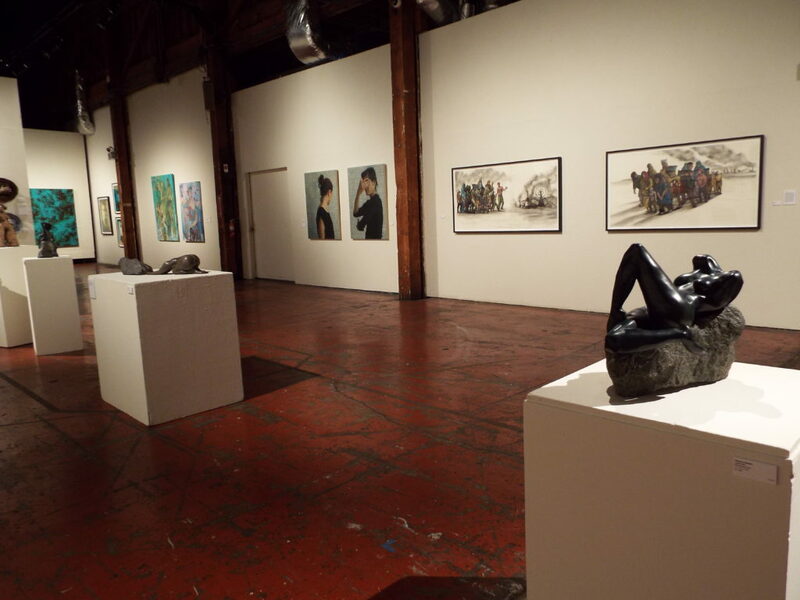 This is Salehi’s first solo exhibition with the gallery. Sepideh Salehi’s practice utilizes painting, photography, drawing and animation to explore ideas of displacement, memory and violence revolving around the poetics of ‘the veil’. 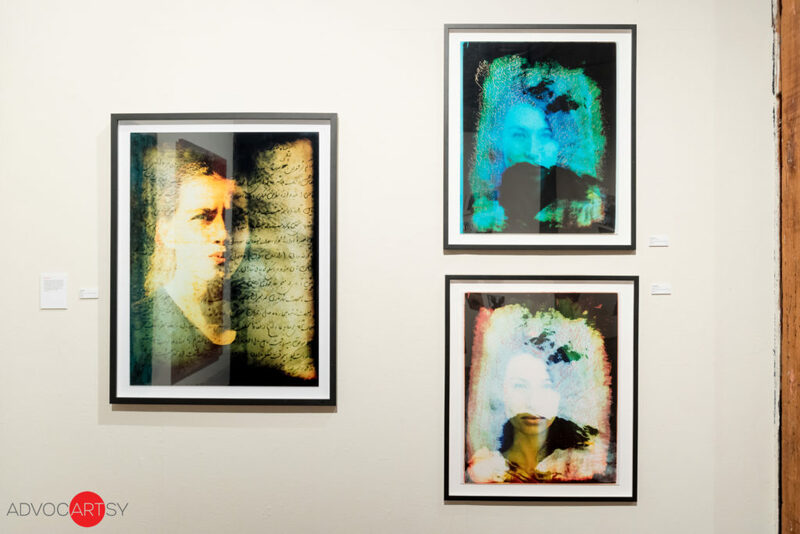 Through Salehi’s use and abstraction of Iranian iconography and language she challenges and ruminates on her experience as a women and immigrant from Iran. She states, “I have used the traditional Muslim prayer stone as a starting point. I borrow the etched images on the prayer stones to create patterns through rubbing and printing. The repeated images of the stones create a rhythm leading me in the end, to an imagery revealing layers upon layers. They form a pattern, or echo words that become evident through this deliberate meditative work process.” Her use of negative space and repetition create delicately intense patterns and compositions that veil and unveil the origin of subject, at times giving protection and obscurity but simultaneously exposing and unearthing the vulnerability in memories. Salehi’s body of work and specifically her use of ‘the veil’ is a protest that is currently shared with women worldwide but especially in a time when women in Iran are contesting the compulsory hijab rule imposed upon them,” says ADVOCARTSY director Roshi Rahnama. Salehi’s use of layering, both physically and conceptually, are used as a device to conceal emotions mediated through decisive yet sporadic and hypnotizing mark making. She often uses words and writing as a form of drawing. 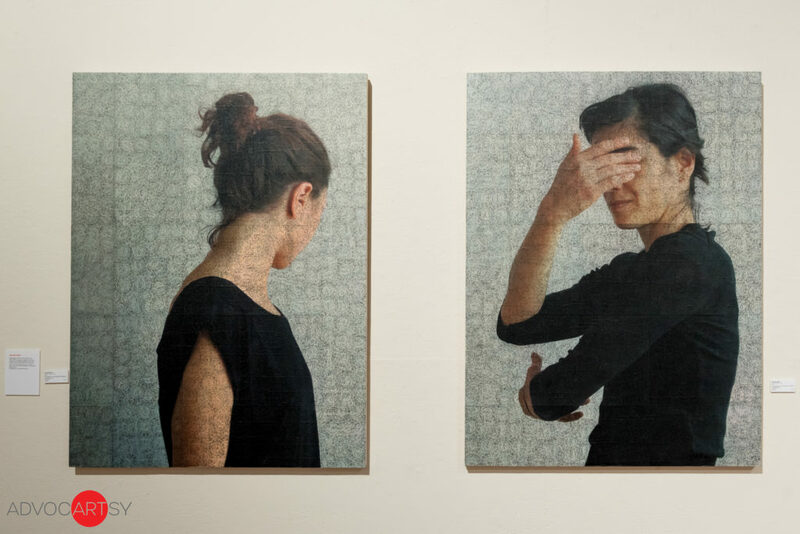 She says, “These drawings emerge from a union between the immediacy of line and the direct and literal communicative properties of writing.” Salehi uses her experience as an immigrant as a direct material in her practice manifesting through her hand but also sees her work moving beyond the confines of her culture. 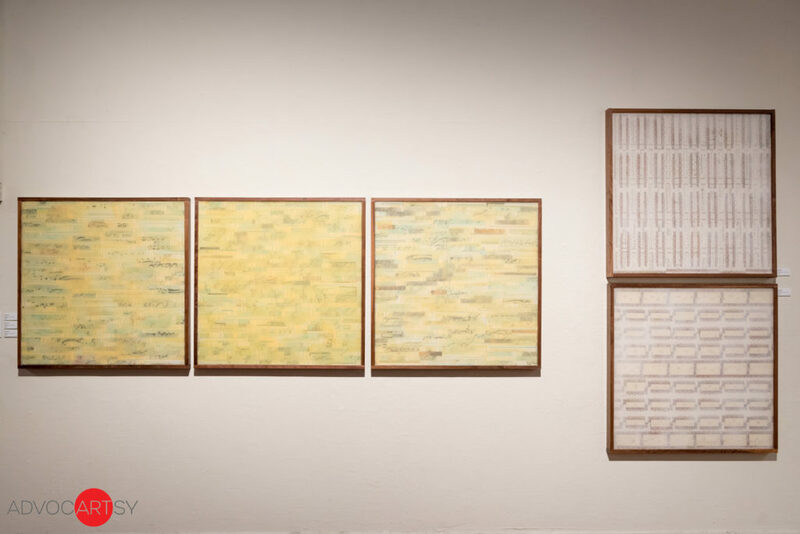 ­Her seemingly meditative and minimal practice complicates itself with the intricacy of the unanswered in a world filled with over sharing and influx of information. Sepideh Salehi was born in Tehran, Iran, and lives and works between NYC and Washington DC. She received her MFA from Academia di Belle Arti of Florence, Italy in visual and multimedia art. 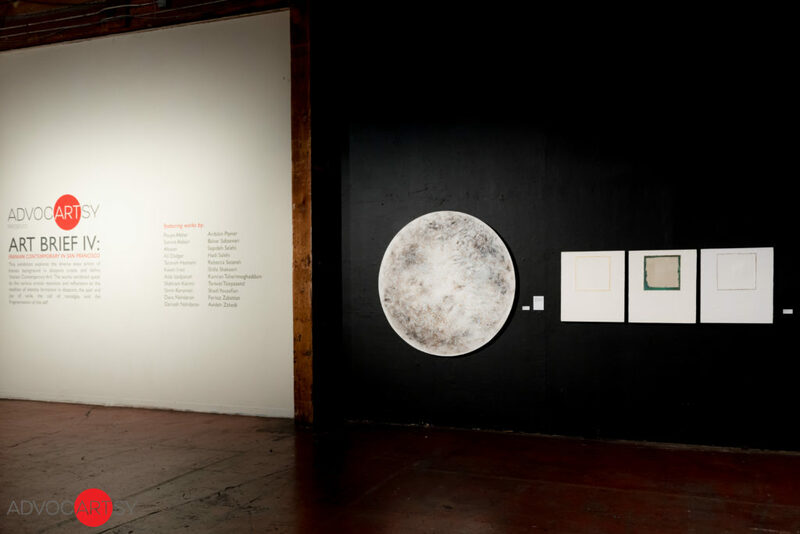 Recent solo exhibitions include Strappa, Rogue Space, New York, NY (2016) and Traces: Drawing in Motion, Kentler International Drawing Space, Brooklyn, NY (2013). 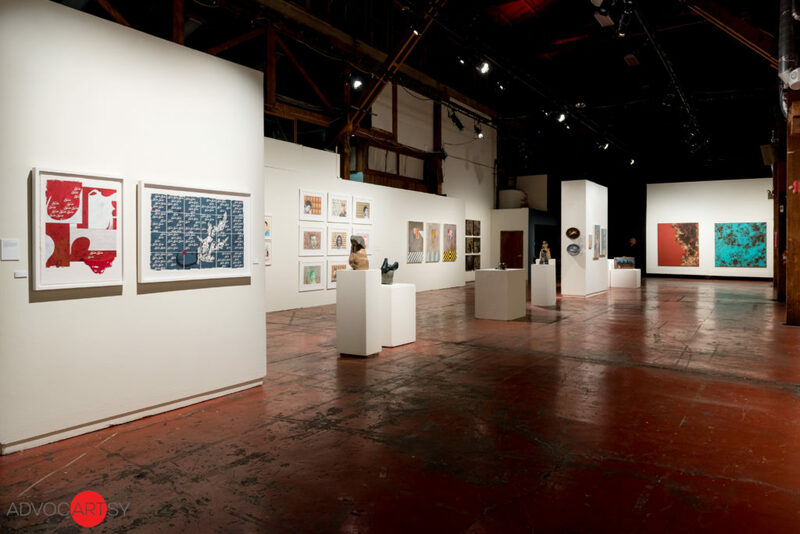 Recent group exhibitions include Art Brief III: The (Un)Draped Woman, Arena 1 Gallery, Santa Monica, CA (2017), Peace on Paper, Iran Contemporary Art Biennale at Niavaran Cultural Center, Tehran, Iran (2016), Archimedes Bathtub, Lorimoto Gallery, Ridgewood, NY (2015), and Are We Already Gone?, Flicker Lab, New York, NY (2014). 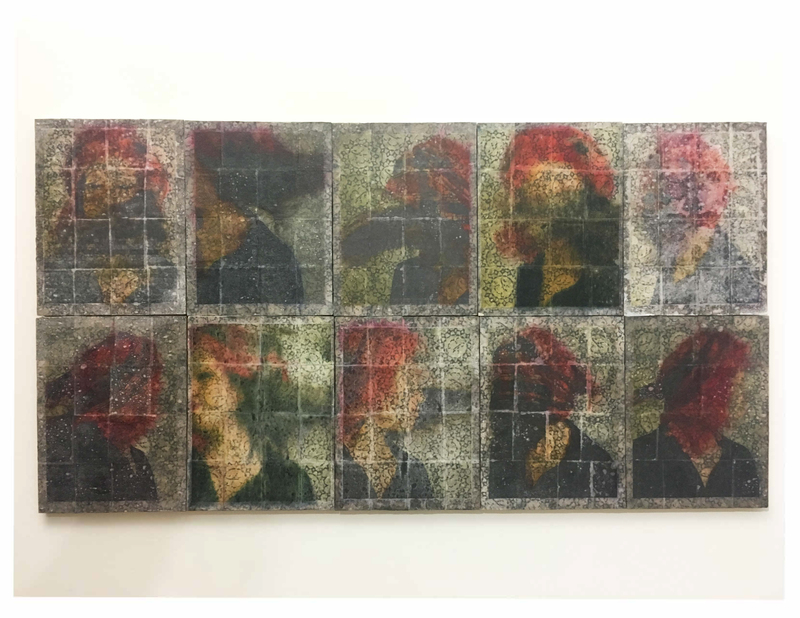 THE SPACE by ADVOCARTSY is pleased to present En Masse, a mixed media installation by Massachusetts-based Iranian-American artist Pouya Afshar. 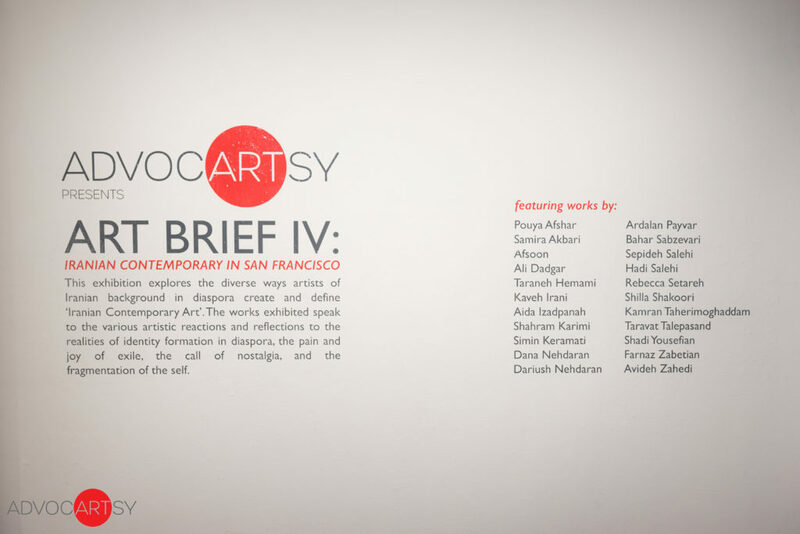 This is Afshar’s first solo exhibition with ADVOCARTSY. 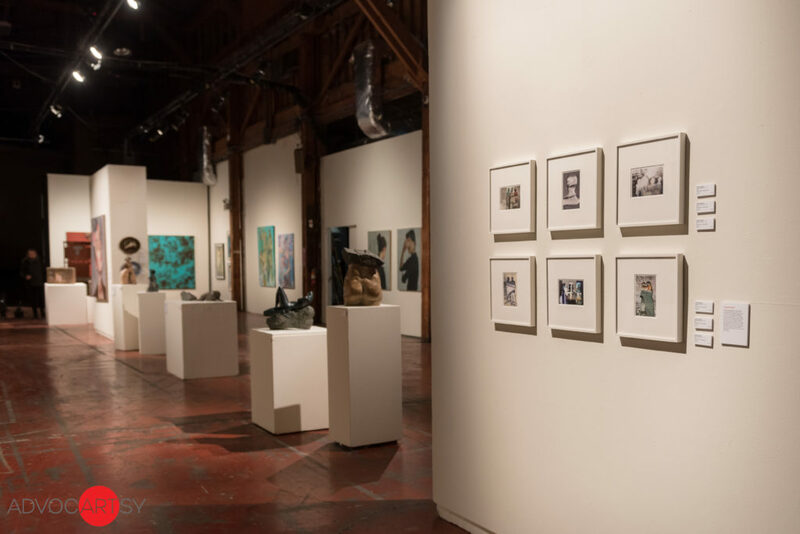 En Masse is composed of paintings, drawings, and animations that explore the process of mourning on a personal, communal, and historical level. Afshar utilizes Persian and Muslim Shiite mourning rituals known as Ta’zie as a mode of contemplation. In Persian culture, Ta’zie is a centuries-old passion play inspired by historical and religious events that symbolize epic spirit and resistance. En Masse was inspired by the death of Afshar’s mentor. 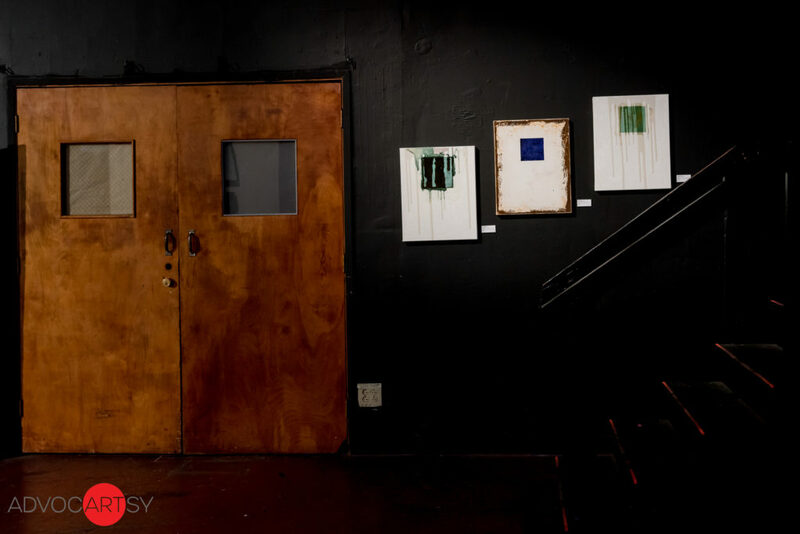 Afshar’s search for internal peace led to an understanding of how individuals find catharsis as a group, whether as performers on stage or as audience members. 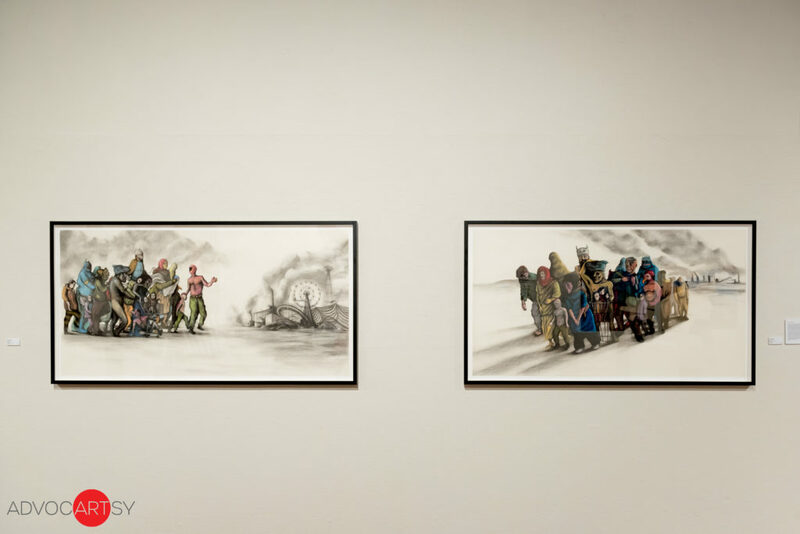 Growing up in Iran, Afshar’s work is also informed by his exposure of Ta’zie plays. He materializes these emotions and traditions through paintings and drawings that he transforms into animation and video projections depicting his memories and dreams. 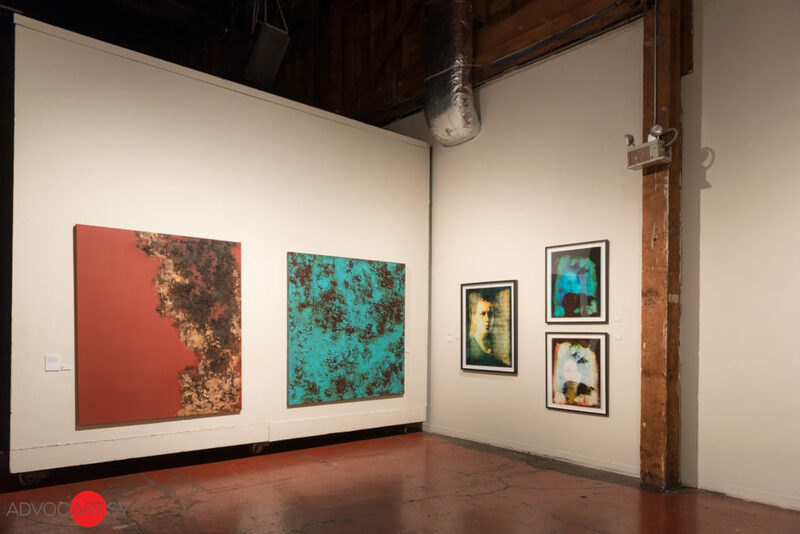 The notion of recollection is also explored in this exhibition through mounted layers of video projections that symbolize particles within one’s imagination. In one animation, a galloping horse—a key element of Ta’zie—is accompanied by a mash up soundtrack of Iranian percussion and a recording of the Catholic prayer Ave Maria. 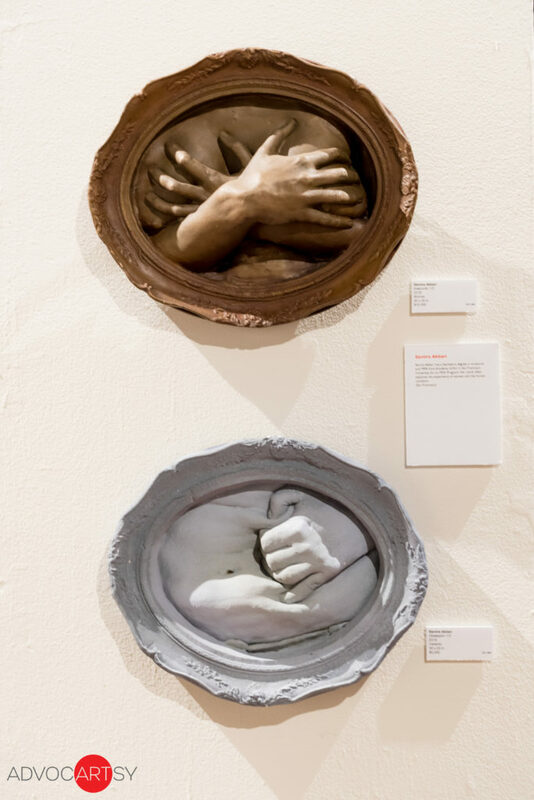 “With this project, I aim to create dialogue on how one can recover from a loved one’s death and why community creates a platform to do so through art,” explains Afshar. Afshar will be included in In the Fields of Empty Days: The Intersection of Past and Present in Iranian Art, presented by LACMA opening May 6, 2018. Pouya Afshar is an alumnus from the California Institute of Arts Character Animation department and is a graduate of the University of California Los Angeles Graduate Department of Film and Television focusing in Animation and Digital Media. 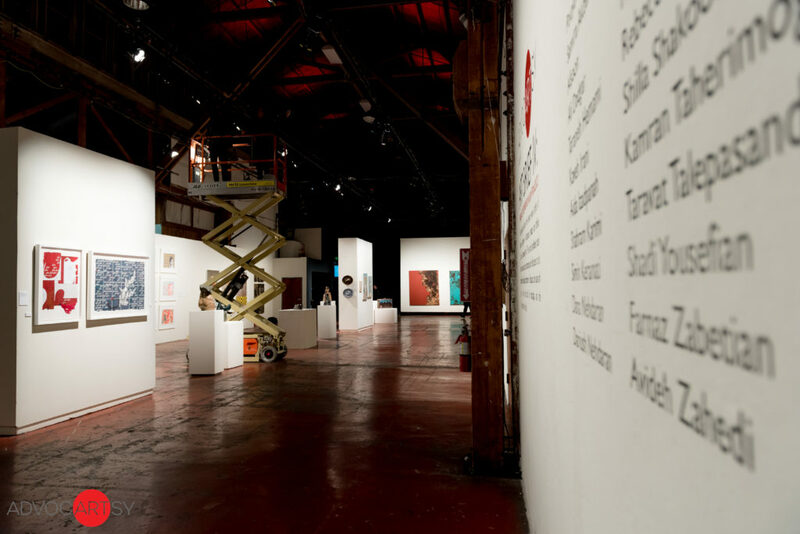 He has exhibited his work throughout the United States and Middle East, including: Harold M. Williams Auditorium at the Getty Center, Bovard Auditorium at University of Southern California, Royce Hall at University of California Los Angeles, Los Angeles County Museum of Art, Santa Monica Art studios, 18th street Art Center, and numerous galleries and art fairs around the world. 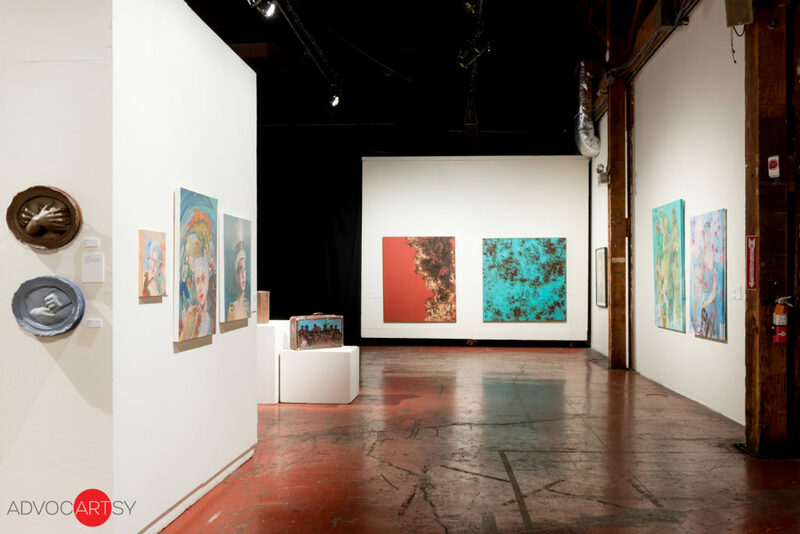 Pouya has presented his research at Stanford University, Harvard University, University of Southern California, School of Museum of Fine Arts Boston, and Residency Unlimited NY. Pouya is the creator, character designer and producer of the animated series Rostam in Wonderland and the co-creator of 1PA2PA comics. 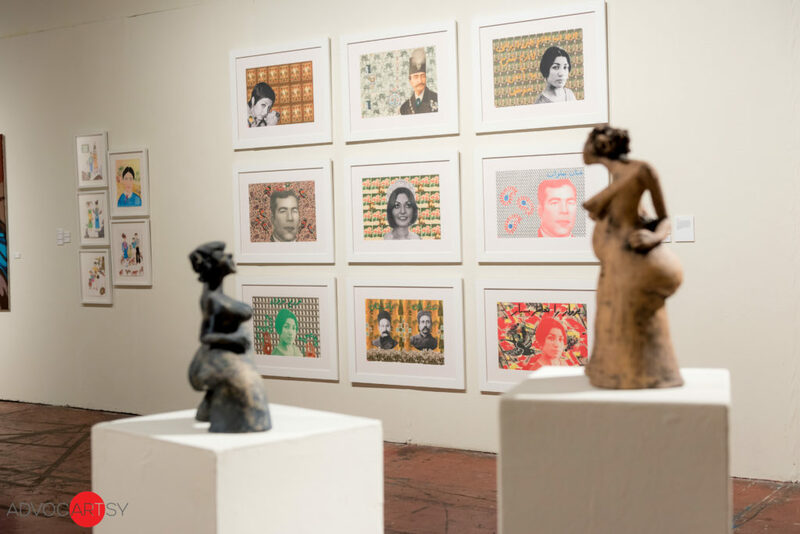 He is currently an assistant professor of art and Design at University of Massachusetts, Lowell. Public opening: Sunday, January 14, 2018, 4–7 p.m. 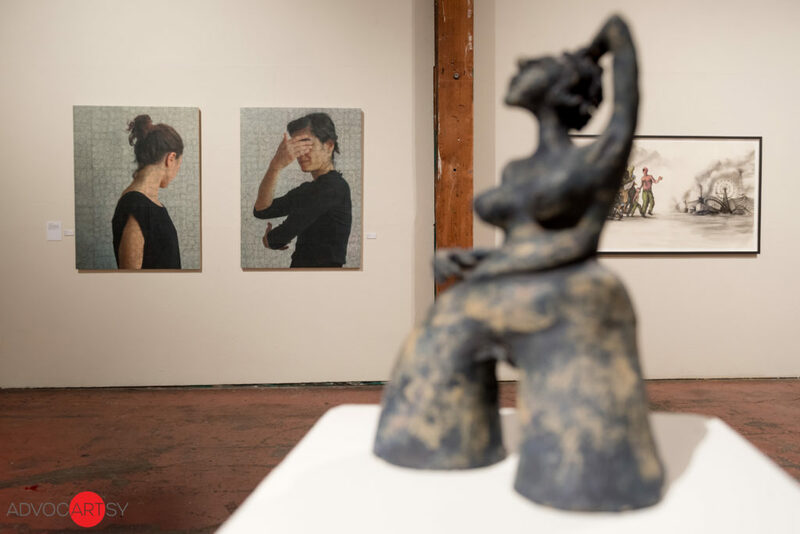 Closing reception: Sunday, January 28, 2018 4–7 p.m. Hours: Tuesday–Saturday, 11 a.m.– 5 p.m.